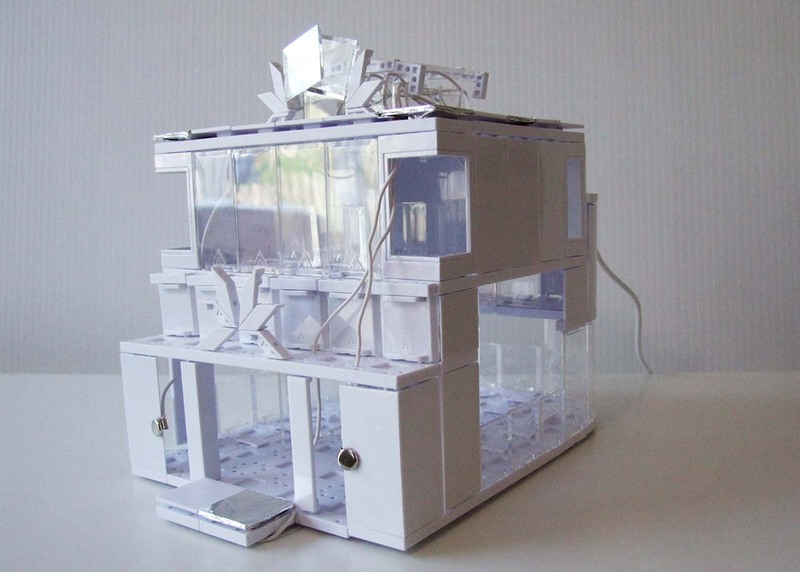 When we first saw the Arckit architectural construction sets we wanted to add electronics to them. So that's precisely what we've done. We've added light and sound effects to a building and created touch sensitive buttons and floor panels. See our Arckit review for more details. You'll need an Arckit set, we'd recommend one of the plain white and clear sets rather than the coloured kits as the lighting effects will be better. A Circuit Playground Electronics board plus a USB cable - alternatives are possible and we'll look at some of those in future. White coated wire that will fit through the holes in the Arckit flooring. We used 1.4mm silicone coated wire. Wire cutters - you can strip wire carefully using scissors or a craft knife but it's much easier with the right tool and it's a good one for young makers to learn to use. Conductive silver paper fasteners. Ours came from a local supermarket and seem to work really well. Aluminium kitchen foil. Not too thick and you won't be able to place wrapped floor tiles next to each other. We considered lots of different electronics kits and boards for this project and we'll try some others in the future but we settled with a Circuit Playground board for our first ArckitTechture project. 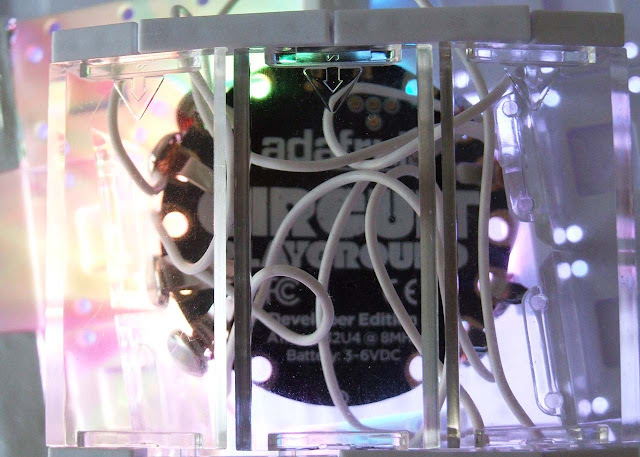 The Circuit Playground is a beginners Arduino board from Adafruit. It has lots of capability built in including a small speaker, RGB LED lights, capacitative touch pads, light sensor and more. This means you can get to the fun stuff more quickly. It's small (4cm diameter) and looks great. It can be programmed via Arduino which is a very popular C-based programming environment for hobbyist electronics and can also be programmed with Scratch. There's also a drag and drop Maker Lab editor from Code.org on the way and a drag and drop PXT editor from Microsoft underway for the upcoming Circuit Playground Express board. This means the board fits in very well with ArcKit's STEAM education mission. See our Circuit Playground review for more details. Capacitative touch means you can connect anything conductive to one of 8 pads on the Circuit Playground to act as a button. 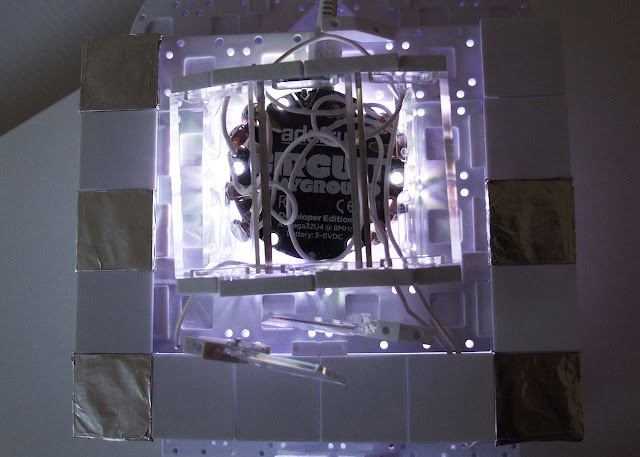 We used paper fasteners as buttons to attach to wall panels and covered floor panels with aluminium foil. We then had to simply wire our inputs to the Circuit Playground board. 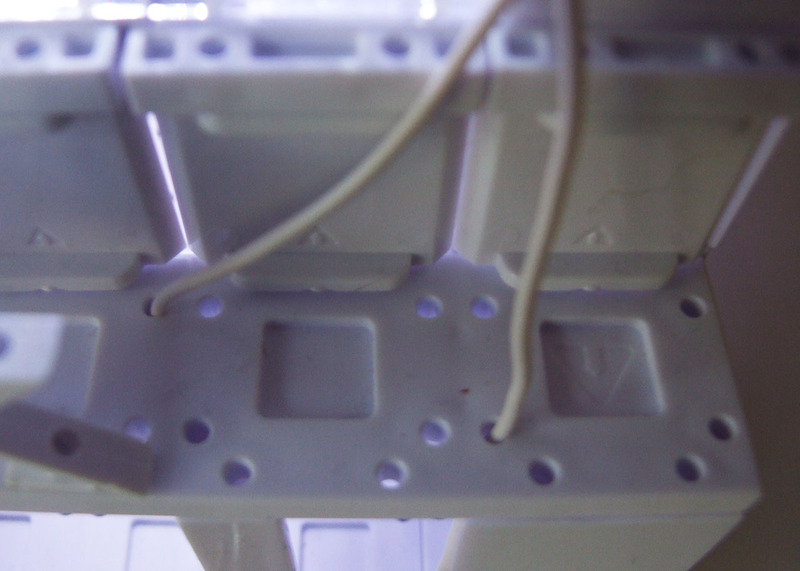 We used coated white wires thin enough to thread through the holes in Arckit floors. This allows us to place the buttons wherever we wanted within the structure and keep things tidy. We attached the wires to the pads on the Circuit Playground using paper fasteners as they are less bulky than crocodile clips. You just need to make sure the paper fasteners don't touch each other. 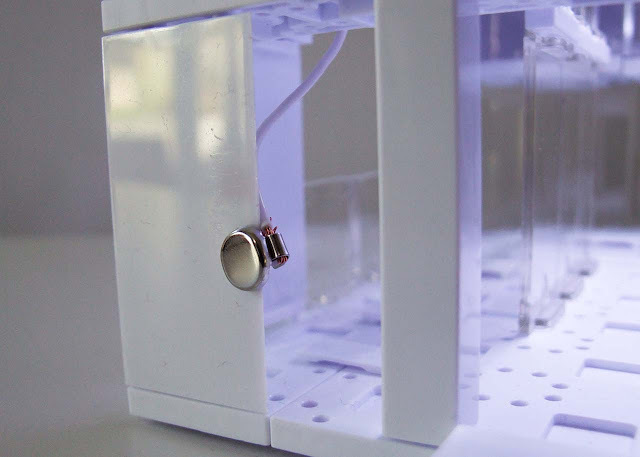 The other ends of the wires are either attached to paper fasteners to act as buttons or threaded under the floor beneath a foil-covered floor tile. 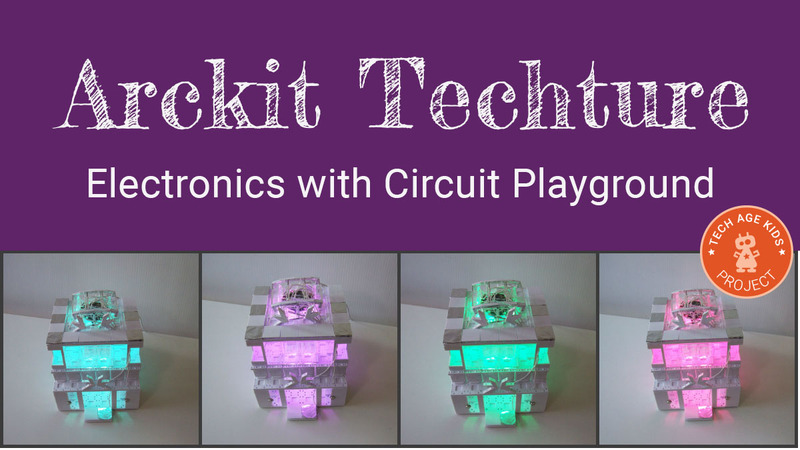 Using Capacitative touch means that the Circuit Playground needs to be powered via USB rather than via a battery pack to get the best results, but the benefits are worth it. For this project, I commissioned an Arckit structure from my 10 year old. I asked for something museum-like with a gallery where we would be able to place the Circuit Playground at the top and have its lights shine down through multiple floors. He modified a structure he had already created and made it taller with an internal gallery. We wanted to use the full effect of the LEDs on the Circuit Playground so we left a 2 x 2 hole in the roof for the Circuit Playground to shine through. A few extra connectors around the edges stop the board from falling through the hole. We considered using white walls around the board to direct the light downwards but we decided that we liked the way that the light leaks and lights up clear parts. My son built a surround to keep in it place and we used Arckit components to make a clear removable roof that can easily be taken off to work with the board. A small Arckit roof extender keeps the USB cable in place and stops the Circuit Playground moving around. We added the electronics one feature at a time, first coding the behaviour and testing and then adding the wiring. First we added a doorbell. You touch a paper fastener at the front of the building and the speaker plays a doorbell sound and the lights flash. You'll know there's someone there! We added another paper fastener button to trigger 'disco mode' with flashing lights and sounds. There's also a floor panel button at the entrance which my 8 year old son designed to be triggered by anyone walking into the building barefoot! This currently triggers a purple flashing effect. On the roof there are buttons to control the lights. On the left are buttons for increasing the amount of red, green and blue, and on the right there are buttons for white and off. This gives you lots of scope for adjusting the lighting by touching the building itself. You can also turn the lights on and off by tapping on the surface that the ArcKit building is on. Turning the lights on and off using this approach remembers the current colour settings. You can adjust the sensitivity of tap detection to get the result you want. If you try and remove the Circuit Playground then there's an alarm sound and the lights flash red! This uses the accelerometer movement sensor. My kids helped with the wiring. They worked out how long the wires would need to be, allowing plenty of extra to allow us to lift up the Circuit Playground. They both used a wire stripper to expose the wire at each end and helped feed the wires around the building. My younger son came up with the idea of feeding the wires up from underneath the floors below the foil-covered floor tiles so they would look neat from above. We didn't try too hard to make the wires follow the walls neatly this time as we were keen to make sure the principle worked but you could tape the cables in place or use loom bands to secure them. 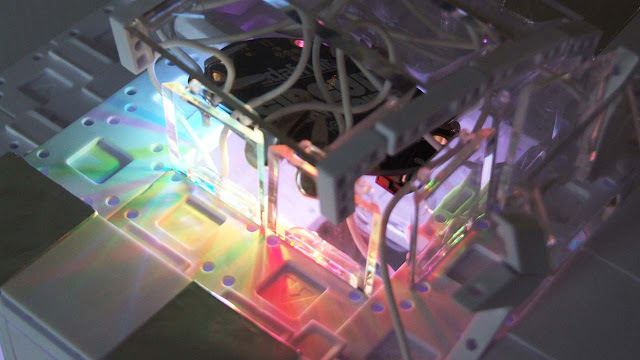 I coded the project in the Arduino environment this first time as that was convenient for me on my Linux machine and we wanted to focus on the physical build to start with. I used the Arduino Create online editor which has support for the Circuit Playground which makes it nice and easy. My kids requested features and I quickly wrote the code to implement their requests. Yes, they could write it, but their typing is slow and it wasn't the focus for this initial project. You could run the Circuit Playground from a battery pack but we found that a white USB cable actually looks better and takes less space. It also means that we can keep tinkering with the code. Arduino was convenient for getting everything working but now we've got everything in place the kids can program the Circuit Playground using Scratch. This is actually better in a lot of ways as it's natural to have two way communication so you can integrate a Scratch project with the Arckit building that it controls. You can then make the building respond to key presses and other forms of user input. Lots of scope for fun projects there. There's also support for the upcoming Circuit Playground Express in the drag and drop Microsoft PXT editor as well as upcoming support from Code.org in their MakerLab graphical editor. We were really pleased with the results of this project. The use of white wires, tin foil and silver coloured paper fasteners means that the electronics blends in with the Arckit building and doesn't look too out of place. We could certainly tidy up the wires to improve the effect. The Arckit raised floor panels and floor holes were really useful routing wires around the building. The white and clear panels work really well with coloured lights. The white wall panels look gorgeous when lit up and the clear panels catch the light really prettily. The LEDs are bright enough to create a strong colour during the day and look amazing at night. An unanticipated benefit is the light patterns cast on the floor as the coloured light shines through the clear parts - this looks especially good at night. The Circuit Playground has a great set of features for completing a project like this without having to do any soldering or breadboard work or even use crocodile clips. Arckit plus Circuit Playground is a brilliant combination for STEAM projects and will appeal to those who are interested in what tech can add to a creative project rather than just being into tech for its own sake.